My dad has seen it all. He has remained patient with me through every type of adversity I could create. He has seen me get kicked-out of basketball games, football games, and storm off of baseball fields; he has watched me be removed from school classes, sent to principal’s offices and sent home from church trips. My dad has demonstrated patience when I have been arrested and been suspended; he has maintained a calm demeanor through dui’s, misdemeanors and calls from jail. It is safe to say that my dad is a patient man. However, if you lose his remote control, he will absolutely go full-blown, donkey kong, red-assed, batshit friggin crazy. Losing the old man’s remote control is a huge “No-No”. A lost remote control is a cross between a tornado drill, a hostage situation, and a sweatshop- protect yourself, be deliberate with your actions but work with ferocity until the remote is found. (95% of the time, my dad was the one who managed to lose the remote control in his recliner, somewhere between his love handle and his asscrack in his recliner, but that was not to be mentioned.) Life stops until the remote is returned. Cancel all plans and re-schedule all appointmentsl; this is an emergency. Don’t mess the settings on the Dad’s TV. The remote control was a matter of convenience. It didn’t make any difference that he grew up in a world where remote controls did not exist- they existed now and that is all that matters. His life did not become easier because of a remote control; he became more entitled to it. The remote control ceased to be a luxury and became a standard. I flipped my wig yesterday. I was given the task of setting up Pedro’s new telephone because his crapped-out. There are few things that aggravate me more than dealing with AT&T or Comcast. I do not have a history of exemplifying patience in this realm. As I sat on hold, patiently waiting to speak with a representative to activate a different company phone, I was already frustrated at the process. (There always seems to be a problem when it comes to shifting data from an old phone to a new one). Everything was going fine until we realized that the service representative had de-activated my phone instead of Pedro’s and we had to start the entire jumbled process over again. It was basically a ten-minute mistake. TEN MINUTES! I was coming un-glued over an ordeal that costed ten extra minutes but involved transferring over six-hundred contacts and thirty gigabytes of data. It would have taken a lot of time, and here I am complaining about ten friggin minutes. My point is that nothing really ever becomes more convenient, we just keep clearing hurdles which give us a running start towards the next obstacle. The chase for the carrot continues but the stick remains the same. I have this delusion in my mind that I am working towards a life of leisure- where all of the tasks are completed and I just sit back and enjoy. I have this idea in my head that I can set everything up to run on auto-pilot and then someday I can sit back and watch it all work. And, when it doesn’t, I get pouty and pissy. The truth is that with every level of convenience there is room to insert another obstacle. Making life convenient doesn’t create more time, it creates more opportunity to fill that slot with things that inadvertently add more obstacles. There is no cruise control. There is no smooth sailing. Regardless of how hard I work to try to build a life that minimizes all of the risks and removes all of the obstacles, there will always be an old man who crams the remote control down his recliner and makes me work until I find it. And if I am lucky enough to make it past that obstacle, then I become the old man that has to deal with kids losing my remote, messing with my TV, and making problems at school. I might as well enjoy the process. I don’t believe that life ever becomes convenient but I can work on becoming more patient. 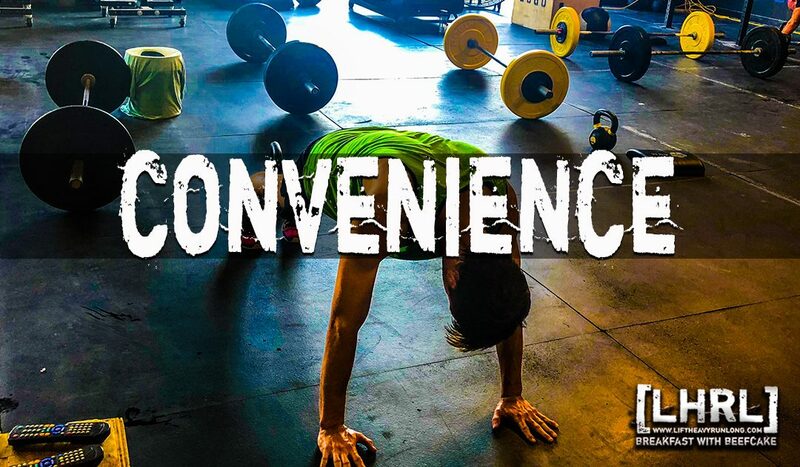 Convenience is not the goal.